A crane system is a critical link in any production process chain and is a substantial infrastructure capital investment. Crane and material handling system manufacturers offer a wide range of systems and products designed to maximize productivity and system performance within a given environment or application. At Kinetics, we don’t believe that a material or bulk handling system should be constrained by the limitations of a DC power supply. Our application engineers have spent over 45 years working closely with original equipment manufacturers of crane systems and heavy industrial users, to developed a product line of DC power supplies specifically designed to maximize and enhance the performance of a crane or material handling system in a given production application and operating environment. Kinetics’ wide ranging product line of crane and material handling power supplies, offers customers a selection of product solutions specifically designed for maximum operational productivity, dependable service and long product life. For cranes with DC powered rails and the rectifier ground based, Kinetics has a selection of product offerings that includes DC substations, constant potential diode rectifiers and SCR regulated out rectifiers. These rectifiers can feed one crane, multiple cranes, multiple crane bays or operate in paralleled with other rectifiers and / or motor generator sets onto a common DC bus. Options such as AC switchgear, redundant N-1 semi-conductor and DC output main and feeder breakers are available options as part of a Kinetics DC substation. For cranes with AC powered rails, Kinetics manufactures a family of rectifiers designed for the highly demanding application of crane mounted rectifiers. A rectifier placed on-board a crane will be subjected to; continuous vibration, mechanical shock, elevated ambients - heat, dirt and fumes. Kinetics takes pride in manufacturing systems for these demanding conditions plus taking into account the needs of a crane builder to have a rectifier unit that is space efficient, has accessibility for service from a crane walkway, efficient in weight design and highly reliable. Our in-house capacity to design and manufacture power transformers, fabricate enclosures or open rack assemblies and power semi-conductor assemblies makes Kinetics uniquely qualified to deliver the highest quality power systems at a reasonable price. Common DC crane voltages that Kinetics manufactures to: 125, 250, 290, 300, 320, 360 and 500 volts DC. "Other" DC voltages are available upon request. Capacity range of 1 to 2000 Kw. DC output voltages to match the desired voltage of the crane control designer. Open racks assembly for mounting side a crane center motor room. Please see Kinetics' Material Handling Application Guide for more information on the type of material handling rectifiers we manufacture. At Kinetics, we take pride in remaining flexible to match a design of a power supply to a given application’s requirement. Number of cranes to be supplied power by the rectifier. 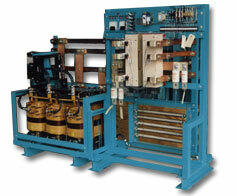 Will the rectifier be ground or on-board the crane mounted? Kinetics, the one source solution.